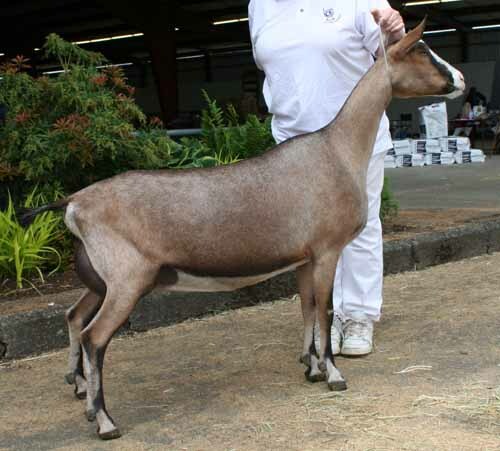 ~Supreme Best Udder in Show @ Washington State Fair over 322 entries! ADELE is a fancy, five year-old that has resurrected our A-Line! We are down to only two "A" does, an Aragonite produce, and ADELE shows why this line has always been a sentimental favorite. She combines style and strength with the smoothest shoulder assembly in the herd. As a kid, she was 2nd at the National Show and first everywhere else. 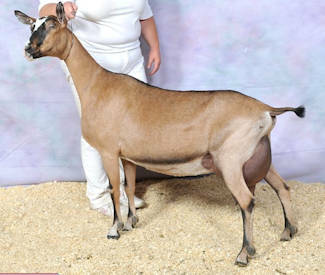 Next season she was 5th place at the National Show and part of both of our first place junior group classes. First fresh in 2014, her mammary is spectacular in rear udder arch and height. It's beautiful (41 RUA, 43 RUH)! 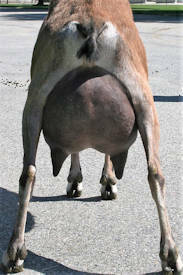 The best thing is that she is milking the most of any doe from her maternal line. Thank you Jack! 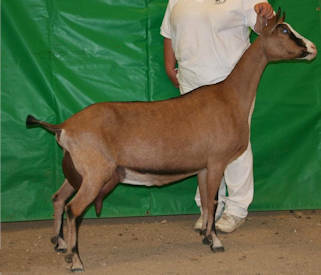 She finished her championship at the second show of the season with a Best in Show title over some beautiful champions from accomplished breeding programs in other breeds. 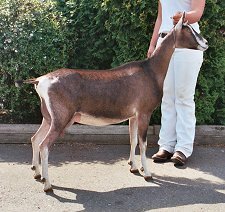 2015 was an even better year for her in very limited showing she was 1st/1st udder 3 year-old at the District VII Alpine Specialty, 3rd/1st udder at the ADGA National Show, and Best Doe in Show at the Wyoming State Fair! In 2016 she freshened with QUINT DOES and it took a very long time for her to recover, she is milking the best of her career, projected just under 4,000 pounds. She was only shown at the Washington State Fair where she was 1st/1st udder 4 year-old, over last year's 1st place 3 yr-old @ the National Show. It was a thrill for her to win Supreme Udder in Show over 322 senior does! This season in 2017 she was shown at the Minnesota State Fair where she was Best of Breed and a part of our Supreme Dairy Herd in Show and also included in our winning Dam & Daughter and Breeder's Trio groups. Pictured below is her dam & grand dam both as first freshening two year-olds for your comparison...I think we are going in the right direction! Her yearling daughter ARANY was 1st/1st udder Milking Yearling and 2016 daughter AUSTINIA was 1st Junior kid at the Washington State Fair! 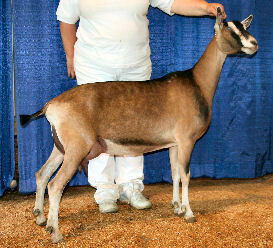 THANK YOU Dr. Grant Colfax of Shining-Moon Ranch for purchasing AUSTINIA at the ADGA Spotlight Sale! © 2012-2018, Olentangy Alpines. All rights reserved.